Most of the newer cordless drivers come with LEDs that help you to light the way. Thank you to Makita for making lights in tools popular. But what if you have an older tool that doesn't have a light, or you need light for you hand drivers. The UFO Tool & Flash Light could be your answer. 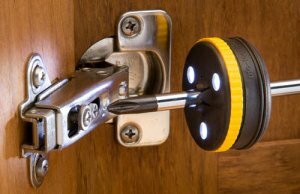 It is a small disk light that can be slipped onto your screwdrivers, bit extensions, Allen wrenches, etc. A turn of the disk powers on three wide beam LEDs, and a magnetic back makes it easy to store in your toolbox. Unlike toys when you were a kid, batteries are included.